Company logos? No. Curating inspiration? Yes. Have you gone to a buffet in Las Vegas? What did you see first? The delicious food or the menu? What catches your attention in an art gallery? The magnificent art or the biography of the painter? Pinterest is like an Ambercombie and Fitch store. Display stimulating eye candy and people will stop and notice. What you pin onto your boards tells a lot about your interests and personality. If you pin “meh”, then people will think you’re boring. But if you pin awesome creative art, deigns, photos and puppies that stir emotions, then people will think of you as a dazzling person and will more than likely follow you. Pinterest is about curating inspiration. Pictures paint a thousand words. Seek your inner Martha Stewart or Picasso and inspire others. What types of photos or designs inspire you? How are you using Pinterest for your nonprofit? What types of images have you seen or posted to your board? Please share your ideas in the comment below. Noland Hoshino is Co-Founder, Social Good Marketing Strategist, Do-Good Enforcer, Content Curator, Volunteer Evangelist and Givologist at [B]cause Media. 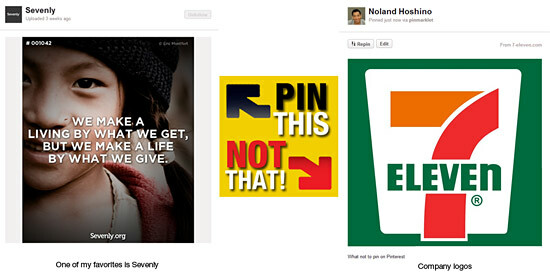 Find his pins at Noland Hoshino on Pinterest and follow him on Twitter @nolandhoshino. Interesting post. I work at the Enough Project (http://pinterest.com/enoughproject/), an anti-genocide non-profit that just started using Pinterest. So far we’ve been sharing news about the conflicts we focus on, and also as a source for our blog readers to see source lists. So each board is like an illustrated bibliography that we can link to from blog posts etc. to provide readers with more sources/information. I’m looking forward to seeing how other non-profits use Pinterest!